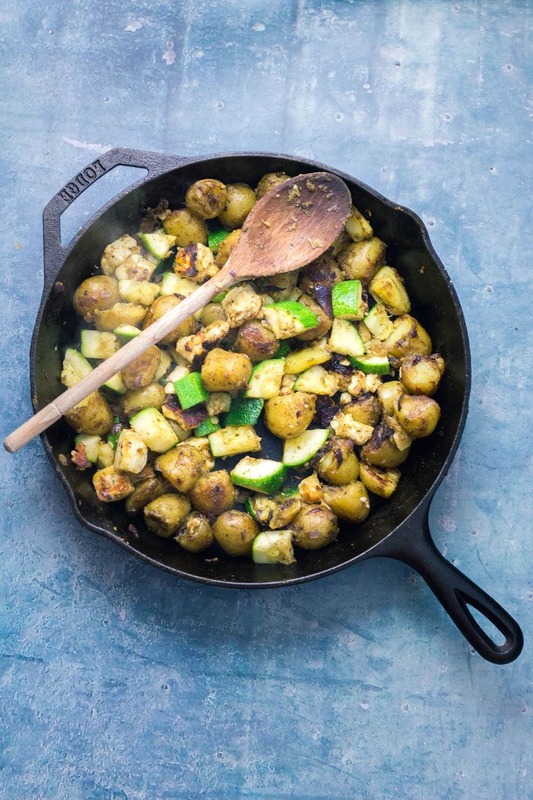 I love this potato, courgette & halloumi hash for breakfast, lunch or dinner! Topped with an easy tomato sauce & a poached egg it’s a guaranteed winner. I use halloumi every which way because it is top of my list of favourite foods but I decided what a really needed was some halloumi breakfast recipes. 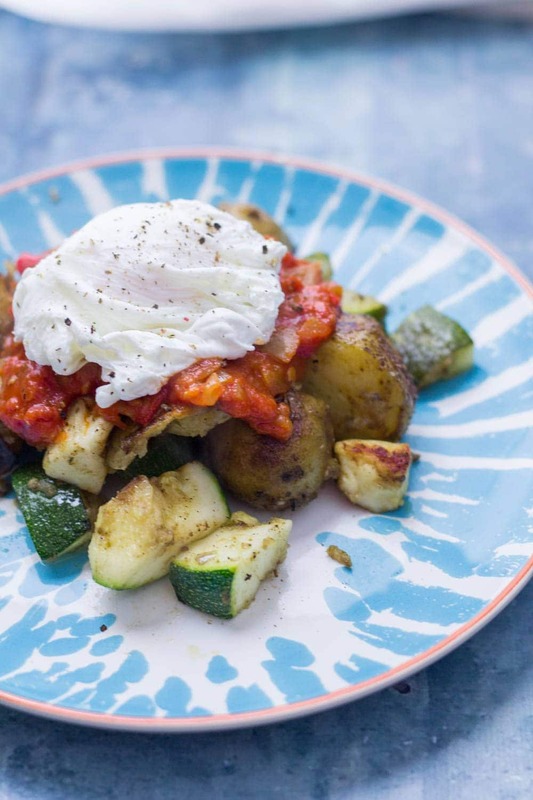 Enter this potato, courgette & halloumi hash. 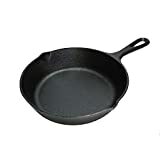 The hash itself is pretty easy and just involves some chopping and cooking up in a skillet. We served ours with a simple but delicious tomato sauce over the top which you could definitely make ahead if you were looking to save a little time in the morning. Finally, of course, there’s a poached egg on top. Because what is a hash without an egg? Ahhh I love a good hash. 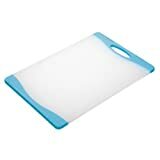 Aren’t they just a great invention? I mean really they can be made up of anything you want, right? Just chuck some of your fave ingredients in a pan, fry them all up and top with an egg and you’ve got breakfast/lunch/dinner. 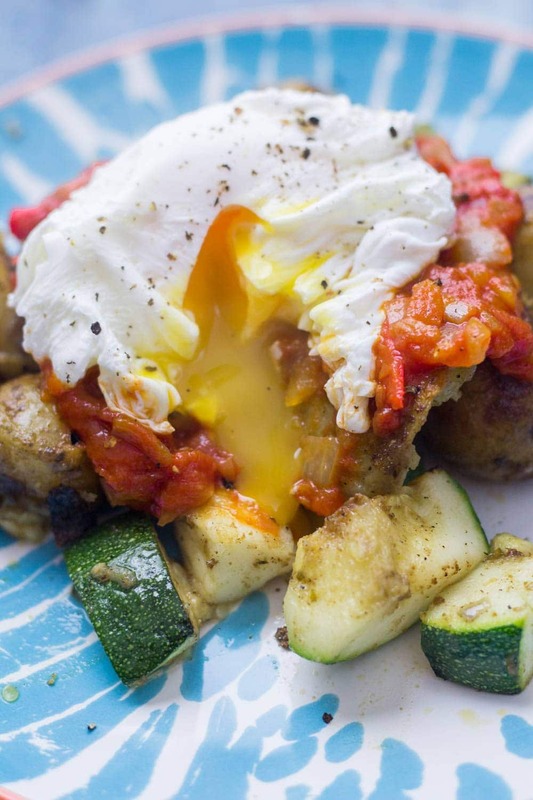 That’s basically what happened with this potato, courgette & halloumi hash. I am REALLY loving the addition of halloumi here. 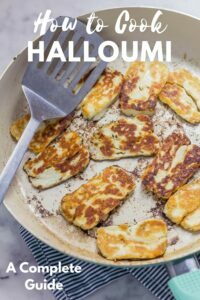 In case you haven’t noticed I’m a little bit obsessed with halloumi (see here and here and here). It’s the most perfect squeaky treat and I think would probably make it to the top of a list of my favourite foods (although please don’t ever make me choose). The great thing about using it in this hash is that it gets all lovely and crispy along with the potatoes and makes a perfectly complimentary texture partner, you feel me? On top of all that the courgette (zucchini) is soft and gives a bit of healthiness along with a super quick and easy tomato sauce. We use courgette in quite a lot of recipes (if you do too try out one of my other courgette recipes). You could just have this hash but I’ve gotta say the tomato sauce and the egg really make it. The runny yolk gets all mixed in with the sauce and coats all the hash ingredients so it’s all just a flavour explosion in every bite! 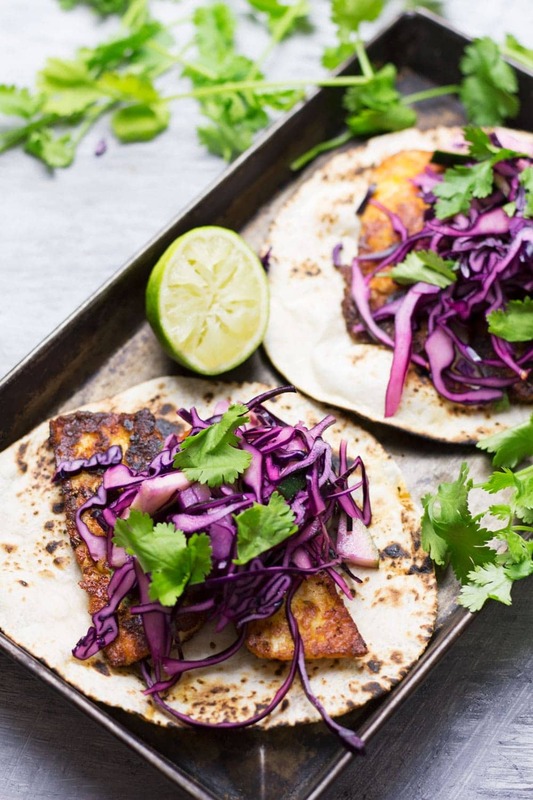 And I now have a whole collection of halloumi recipes so make sure you check that out too! 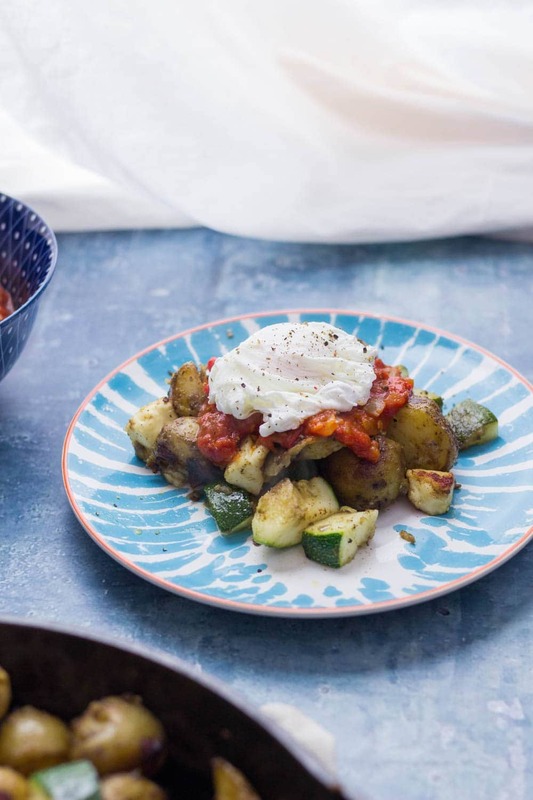 WONDERING WHAT TO DO WITH THE LEFTOVER INGREDIENTS YOU’VE GOT FROM MAKING THIS POTATO, COURGETTE & HALLOUMI HASH? 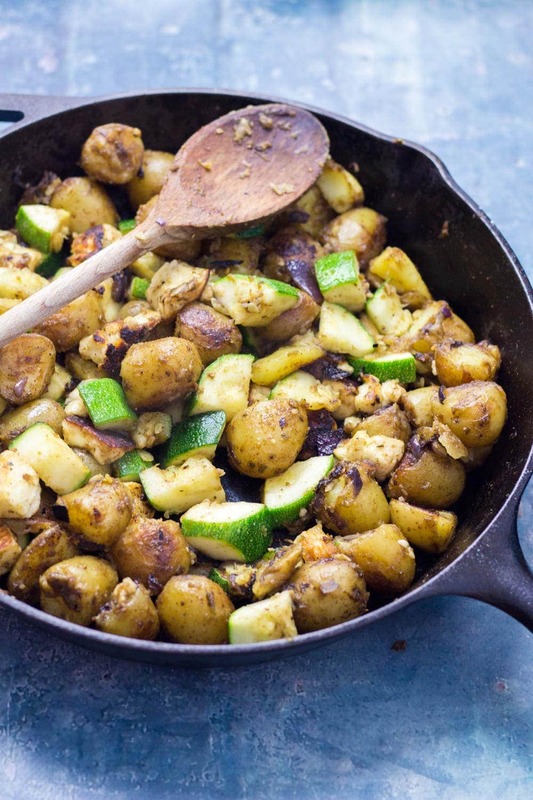 I love this potato, courgette & halloumi hash for breakfast, lunch or dinner! Topped with an easy tomato sauce & a poached egg it's a guaranteed winner. Boil the potatoes in well salted water until nearly cooked, about 20 minutes. Drain and return to the pan you cooked them in with the cornflour. Place a lid over the top and give the potatoes a good shake to fluff them up. Heat the olive oil in a skillet over a medium heat. Add the potatoes, season and fry for 5-10 minutes without moving too much so they start to get really crispy. Add the red onion, garlic, halloumi and courgette followed by the cumin, chilli powder and oregano. Fry for another 10 minutes. Serve topped with the tomato sauce and an egg. Heat the olive oil over a medium heat. Add the onion and soften for 5 minutes before adding the chilli. Tip in the chopped tomatoes, sugar, salt and smoked paprika and cook down for 20 minutes. Once the sauce has reduced remove from the heat and add the white wine vinegar. I see healthy breakfast and I like it! I love how you’ve topped this with a poached egg! This looks like my ideal lunch that I’d eat every day of the week without ever getting bored! Yum, YUMMY. I love potato hash, especially with a beautiful perfectly cooked egg on top! I could probably eat it 3 times a day too!! 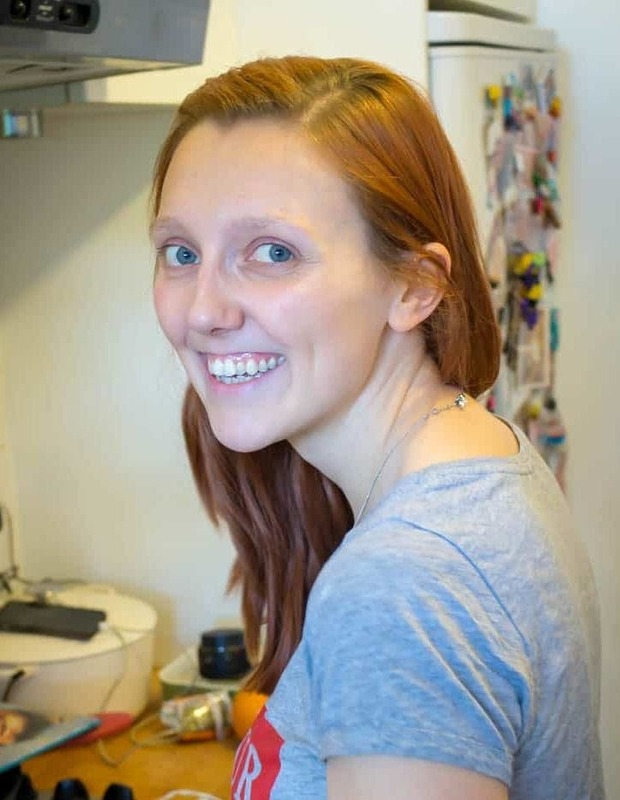 I can’t wait to try your Halloumi hash recipe! 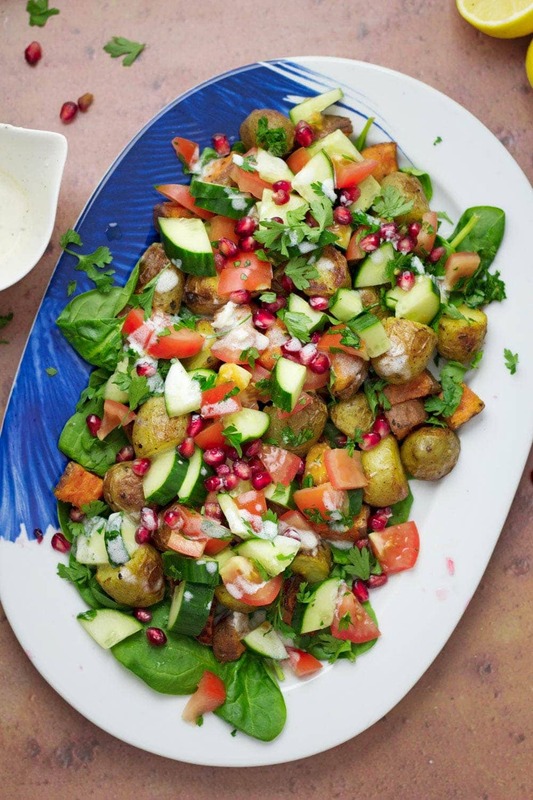 Such a lovely side dish or main dish! Your tomato sauce is perfect! I love the topped egg! This looks amazing!